The Mona Lisa – ‘la Gioconda’ in Italian – is the Leonardo’s most famous painting all over the world. The portrait is exhibited at the Louvre museum, in Paris, and it is protagonist of a lot of legends and mysterious stories. One of these stories is certainly true and very adventurous: the story of its theft, happened in 1911. However, maybe not everyone knows that, “thanks” to the theft, the Mona Lisa was exhibited at the Uffizi, together with the others Leonardo’s paintings hosted in the Gallery: the Annunciation and the Adoration of the Magi. At the Uffizi there are also some sketches and the famous Baptism of Christ, by Verrocchio, Leonardo’s master. In this last painting, the touch of Leonardo is clearly noticeable. The legend tells that, after observing the finished work, Verrocchio decided to quit painting, because the talent of his pupil made him loose confidence in his own ability. But why did the Mona Lisa arrived at the Uffizi? 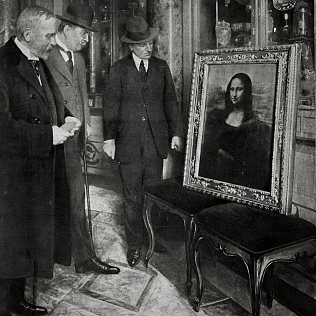 We have alluded to the theft of the Mona Lisa, stolen in August 1911. Vincenzo Peruggia was the author of the brave feat: he left the museum with the painting hidden under his coat and he kept it with him for two years. Why did he steal the portrait? Peruggia – who worked in the museum – had made the case in which the Mona Lisa was preserved. He found out that some of the artworks exhibited in the Louvre museum had arrived in France from Italy, during Napoleon’s Italian campaign. He decided to carry out a patriotic action, by giving back to Italy Leonardo’s masterpiece. It is known that the Mona Lisa itself is not one of these artworks. Indeed Leonardo himself took the Mona Lisa to France, where he probably finished it. He started working on it in Florence, but in 1516 he moved to France and probably he sold the portrait to the king Francis I, together with other artworks. From that moment, the painting became property of the French kingdom first, and then of the French republic. However, Peruggia was successful in putting off the scent of the painting, and he decided to bring it in Florence. Once in town he got in touch with an antique dealer, signing himself as “Leonardo”. The antique dealer confirmed the authenticity of the painting, but he also called the police. The thief was captured. Giovanni Poggi – the director of the Uffizi at the time – obtained to keep the Mona Lisa at the Uffizi Gallery until January 1914. So, an extraordinary exhibition was prepared, with the most famous portrait in the world and the two masterpieces by Leonardo at the Uffizi – all together for the first time – the Annunciation and the incomplete Adoration of the Magi. The painting could stay for some time in the same town in which Leonardo had started painting it, and where Lisa Gherardini – the Mona Lisa portrayed – was born. From Florence the Mona Lisa was taken to Rome, where it was exhibited for another period of time, before it went back to Paris. The extraordinary theft made it very famous all over the world, even among people who do not know much about the history of art. So the Mona Lisa’s air of mystery grew up and it still makes this masterpiece very unique.